Today, I’m sharing one of my favorite vegan soup recipes that is not only insanely delicious, but it’s full of healthy ingredients, and each large serving is incredibly satisfying. It’s loaded with beautiful greens like peas, asparagus, basil and spinach, and it asserts that deliciously fresh, spring-like flavor. At 5 Points per serving, it makes a healthy and hearty Weight Watchers lunch idea, served with fresh bread or a baked potato. If you prefer your soup a little more thin, just add more of the vegetable broth, as desired. Also, feel free to play around with the strength of the seasonings, using more or less as your tastes prefer. 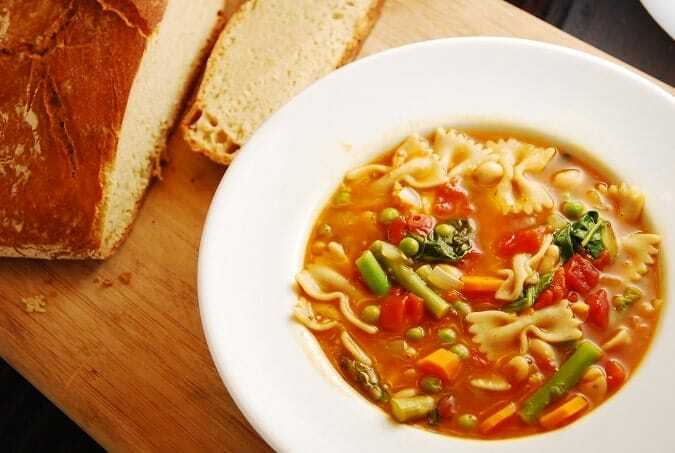 But this Spring Minestrone Recipe is definitely a dish that will have you feeling good. Enjoy! An amazing Weight Watchers Vegan Recipe that lets you really put those farmer’s market vegetables to work. This delicious Spring Minestrone is so fresh, flavorful, and filling, you’ll be more than satisfied for just 5 Points. Place oil in a large pot or dutch oven, and set over medium high heat. Add in onions and garlic, and sauté until slightly tender, about 2 minutes. Add the diced tomatoes, broth, salt, pepper, thyme, red pepper flakes, bay leaves, and oregano. Bring to a simmer, then turn heat to low, cover and cook for about 15 minutes. Add in peas, carrots, asparagus, and beans. Cover and cook for another 15 minutes. Now stir in spinach, pasta, basil and lemon juice. Cover and cook for another 15-20 minutes, or until spinach is wilted. Ladle soup into bowls and serve with optional grated Parmesan cheese. 1 tbsp of thyme was so overpowering that I had to throw the soup away. No one would eat it. Definitely want to try it again with much less thyme! thanks for the recipe.